TJ’s very own Ms. Moore has a positive impact on the TJ community. 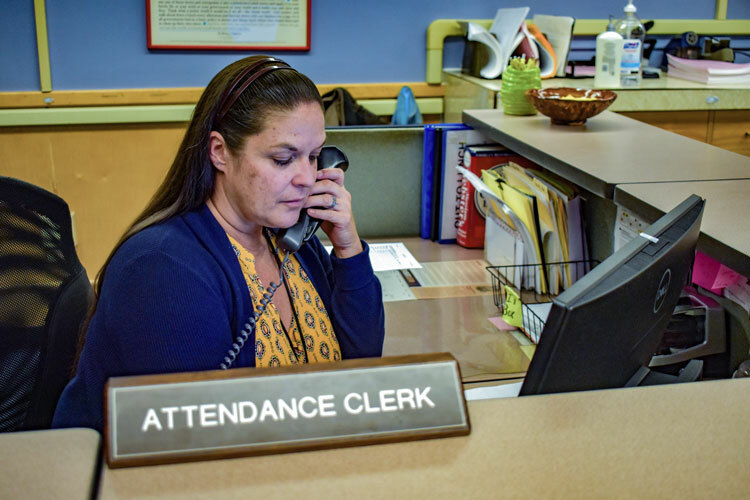 Rebecca Moore has been working at the front desk at Thomas Jefferson High School for the past five years as the Attendance Secretary. She has become a motherly presence around the school, greeting students with a smile and making them laugh. Her spirit and passion brightens up the days for those who encounter her. Moore is not originally from Colorado. She grew up in Prescott, Arizona. She moved with her husband and oldest child to Colorado in 1988. When she moved, she began working at Safeway as a Head Clerk, a position she held for 12 years. Since her time at Safeway, Moore has worked multiple jobs relating to education. First, she was a secretary in the Cherry Creek School District, and then worked for the State of Colorado evaluating teacher licenses. Support staff like secretaries and janitors play critical roles in the everyday operation and success of schools, but often do not receive the credit they deserve. They work the same amount of days and hours and often stay late to make sure the school is the best possible environment for students. The jobs they are doing may seem simple to many, but schools would not be able to function without these people. For example, secretaries help with angry parents, busy teachers and administrators, and ensure that the people in the building are supposed to be there. Next time you see support staff in the school, thank them for the important work they do for schools. In a few years, Moore plans to retire in Shreveport, Louisiana. She and her husband had originally planned to buy a large lot so they could build their own house, but a different property caught their eye. They are currently in the process of negotiating to buy a property with two houses on it: a main house and an ‘in-law’ house. The property also has two acres of land for lots of enjoyment in the coming years. Moore is excited to retire, to spend more time with her family, and to get to know her new home better. And most importantly, she is ready to relax in a slower-paced lifestyle and enjoy what life has to offer. While most of the time students find themselves at Moore’s desk to receive a tardy pass, she is always willing to strike up a conversation to connect with others. Go to the main office to meet her! You will not regret it.